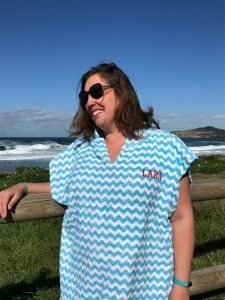 If you have a swim team, water polo team or other sports team that want something practical and useful with your team logo and/or name on it then welcome to the wonderful world of LOLL custom poncho towels for teams. 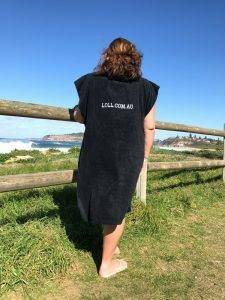 How Do LOLL Custom Poncho Towels for teams work? There is no minimum order quantity if you use one of the LOLL range that we have in stock. Just choose the one you want and get in touch with details of the text or logo you’d like on it. 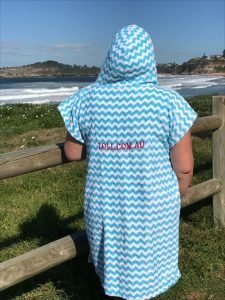 The price for adding your logo or text in embroidery starts at AUD$25 depending on how many words/how big your logo is – there is no set up cost. To have up to 15 letters of text as we have on the black one it would be AUD$25. As logos can be more complex once we have your logo we can give you an accurate quote. The price of the LOLLs reduces when you order 5 or more. Orders over 20 LOLLs will reduce the price further. These custom poncho towels take around 4 weeks to be produced once the design has been finalised plus shipping time from China. If you want a sample shipped to you that can be done (for an additional cost, this takes around 2 weeks). Production will still be four weeks once you have received and approved the sample. Shipping will be included in the quote to one destination this varies depending on the number ordered, location sent to and how fast you need them.